Devoted daughter of the late Max Glasel and the late Louise Hofstetter. 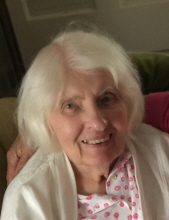 Helen was a long time resident of Franklin Park, and a long time member of St. Paul's Evangelical Christian Church of Franklin Park. She will be missed by her St. Paul's friends and neighbors. A visitation and service will be held at Sax-Tiedemann Funeral Home, 9568 Belmont Ave., Franklin Park on Sunday, March 24, 2019 from 2:00 pm until the time of the service 3:45 pm. A private interment is scheduled for Arlington Cemetery. "Email Address" would like to share the life celebration of Helen L. Glasel. Click on the "link" to go to share a favorite memory or leave a condolence message for the family.